Take on a fun and creative project with this new digital kit that centres around noteworthy people or events! The non specific theme will have you returning to this kit again and again when creating your scrapbook layouts, cards and mini albums. The attractive contrasting colours of this digital kit will definitely get your creative juices started and once you scroll through the striking background papers and plethora of elements you will most certainly see your ideas forming. 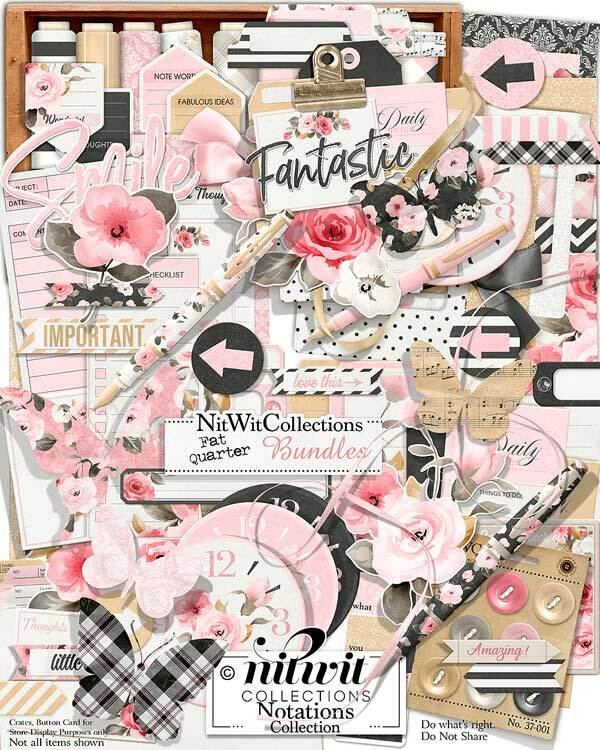 Use this scrapbooking and card making kit for nearly any theme....it's versatility will excite you! 4 Circle pointer elements...now which way is North? 3 File folder elements....so many pieces to keep together....is your creation about planning or poking fun at a little clutter? 5 Folder labels, some that are a little simpler and some that are already embellished...which one works for you? 1 Note tag with a journaling area - "Special Thoughts"
5 Pen elements...don't your words come easier when you write them with a beautiful pen??? 4 Reminder tabs....what's that you say?? 2 Digital stamp sentiments - "Smile" and "Fantastic"